In the early nineteenth century connections were made between the aesthetic and non-aesthetic codes in relation to women, prophets, gipsies and fortune-tellers, which profoundly shaped the reception of the Cassandra myth throughout the Victorian period. Connections between Cassandra and these social icons went beyond the page and illustrations in magazines, paintings and popular entertainments depicted Cassandra-like gipsies, witches and seers. 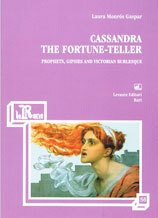 The interaction between the intellectual frame and the cultural texts which depicted Cassandra in Victorian England was revealed by the parallelisms between translations of Aeschylus’ Agamemnon, for example, and pictorial representations of the myth which made a link between Cassandra, evil and witchcraft. The refiguration of Greek tragedy in classical burlesque introduced a group of heroines who questioned authoritarian values under the guise of humour. Medea, Alcestis and Antigone, for example, anticipated subsequent depictions of New Women; and the subversive Cassandra is refigured in the essays of Florence Nightingale and Margaret Fuller as well as in burlesque. Robert Reece’s burlesque Agamemnon and Cassandra; or, the Prophet and Loss of Troy was first staged in Liverpool in 1868. The juxtaposition of Cassandra’s frenzy with witches, false prophets and madwomen coexists for the first time in Robert Reece with the wise and heeded Cassandra vindicated by Nightingale and Fuller. An intertextual analysis of Robert Reece’s Agamemnon and Cassandra shows that nurtured by the arts, culture and daily lives of the Victorians, burlesque echoed the full spectrum of Victorian political, prophetic and feminist Cassandra. The ambivalence of the genre favoured the coexistence of opposing refigurations of the myth and staged both a scorned and strong-minded heroine. As demonstrated in this volume, the syncretism between highbrow and popular refigurations of the Cassandra myth allow us to recreate the sociocultural mindset which suffused the Victorian contribution to the reception history of the Trojan princess. The book cocnludes with an annotated edition of Robert Reece’s burlesque Agamemnon and Cassandra; or, the Prophet and Loss of Troy (1868).